On a bustling lunch hour at noon on a Wednesday, a snail like line of preschoolers were putting their plastic caps on, to cover their heads, before getting a behind the scenes look at Breads Bakery. This was the third school tour at Breads Bakery on this chilly, wintery day. The open door policy and warmth of Breads Bakery makes sense once you meet the Israeli owners Gadi Peleg and Uri Scheft. Scheft is a Danish-Israeli pastry chef and owner of three "Lehamin" (breads in Hebrew) Bakery locations in Tel Aviv, Israel. Scheft was "lured," their words not mine, by Peleg to open Breads Bakery flagship NYC bakery/cafe. 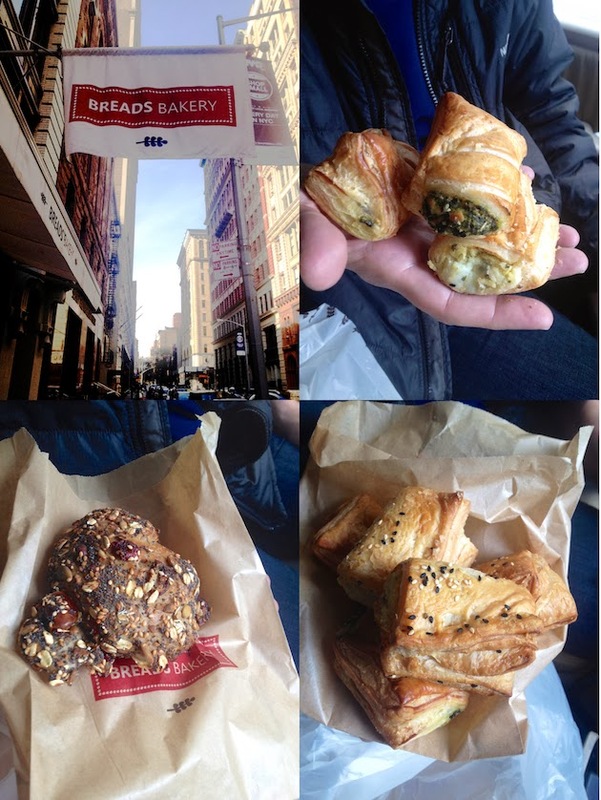 After a year and half of location scouting, according to Scheft, Breads Bakery finally opened its Union Square, Manhattan doors just a little over a year ago, today. Scheft's journey to the art of pastry began with growing up with the hearty Scandinavian Breads and pastries from his Danish heritage. Both his parents are Jewish immigrants to Israel from Denmark. Israeli born (1962), Scheft often visited his extended family in Denmark while growing up. Fast forward with a degree in biology, and as many Israeli young adults, a right of passage journey to India, Scheft found himself landing in pastry school in Denmark. Thirteen years ago he opened Lehamin (Breads in Hebrew) Bakery in Israel. The excellent sweet and savory pastries and breads keep the locals and tourists, like me, alike, coming back. With a turnover this high it explains the abundance of pastries and breads you see as you enter. Breads Bakery is particularly famed for its chocolate and Nutella babkas and rugulach, but there is more to it than these two celebrated Eastern European, Jewish bread and pastry. I've been hypnotized time and time again, over the years, watching videos and seeing photos of Scheft's challah making online. The challah dough, so pliable, smooth, the work space, spotless, and the chef's technique, immaculate. The addictive olive straws, or bread sticks, I even baked myself in the past and inhaled as soon as they came out of the oven, piping hot. The almond croissant is a must-have. A flaky pastry filled with spot on marzipan almond paste. I love having cheese or cheese and spinach burekas with a cup of soup for lunch at the cafe. The muesli bread reminiscent of everything Scandinavian is probably my most recent favorite. Scheft commented on the challenges of surrounding yourself with the right staff when opening a new place: "the art is not only in the bread making, but also in fostering freedom of creativity in your employees." The retention rate of a well trained staff at Scheft's bakeries/cafes is high due to this very philosophy. He introduced me to the manager at Breads Bakery and a pastry chef who was working on gigantic heart shaped Valentine's Day, what looked like, Linzer marzipan cookies. Both are trusted employees he brought with him from Breads Bakery in Israel, to help him open and run Breads Bakery in the US. While getting a behind the scenes look at Breads Bakery, Scheft was working on a new oat honey bread inspired by tastes and aromas of his childhood and Danish roots. The base to this bread was an oat porridge. His movements in the kitchen were so intuitive and fluid. His baking came with such ease. Only the confidence that a wealth of experience can permit. The new oat honey dough was so supple, I can only imagine the flavor and texture baked right out of the oven a few hours later. When I asked the very personable Peleg about plans for an expansion to DC (a girl can hope), he responded: "I love DC, Bethesda and the neighborhoods in the area, but not in the plans for now." 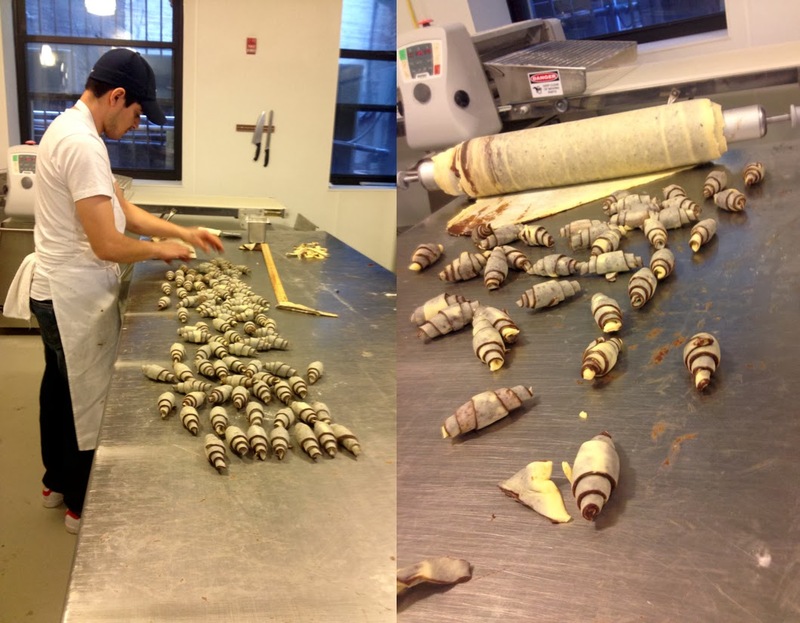 Peleg stayed mum about a second location of this NYC meets TLV bakery/cafe in a neighborhood nearby in Manhattan. 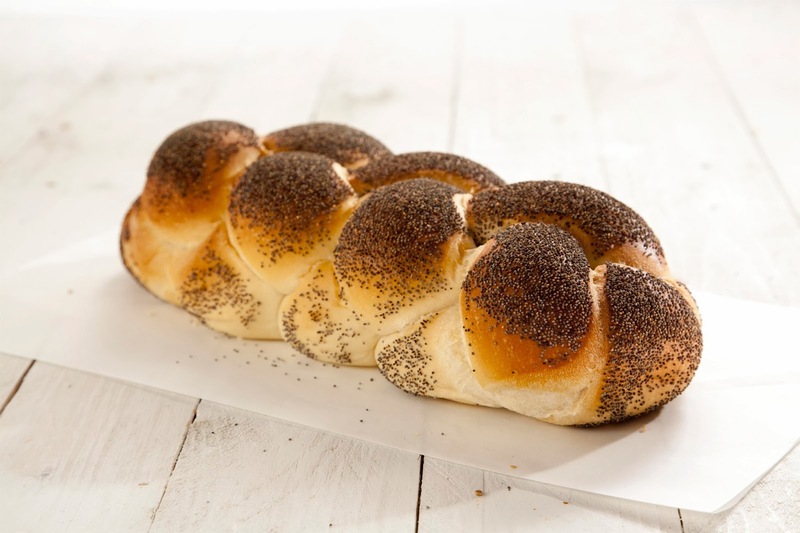 I bet there is more to come from this Peleg-Scheft Israeli duo, in addition to the translated into English Breads Bakery cookbook edition, so stay tuned. Meanwhile, I can imagine the many kindergartners that marched in and out of Breads Bakery on a field trip since my last visit there. With snow melting from the soles of their little feet and plastic caps on. In anticipation of seeing how bread is made. Getting a glimpse just as we did behind the scenes. Divide dough (using a knife) into 3 equal parts, and divide each part into 3. All photos, with the exception of the Challah by Dan Lev, were taken on the iPhone camera. Sorry I missed this on my last visit to NYC. Must try next time, looks so great. Great pastries and bakery! That challah looks absolutely fabulous. Looks so good! I miss these pastries! As a Jewish girl who grew up with no surrounding Jewish community, this post just kills me. Makes my mouth water bad. I want one of each. Maybe not DC, maybe Denver? Those pastries and breads looks fantastic! I've always wanted to make Challah; I'll have to try this recipe! Loved following your trip to NYC. So delicious and so many incredible flavors in that incredible city. Those pastries are fantastic and that challah is divine!! Wow, that bakery looks amazing! Everything in it is beautiful! looks amazing and great docu reporting!